As I mentioned in my last post, Marie Kondo recommends tidying in a certain order, which is often referred to as the KonMari method. Of course, you are free to tidy in any order you chose, but as I am a recovering perfectionist, you know full well I have been working through the list in order. I can’t help it. Ok, wait. That’s not one hundred percent true either. As I have been working through our books, I have also gotten a head start on papers, which is the next category. Not because I wanted to cheat, but because I have been working on a reorganization project in our home office, and our filing cabinet was in serious need of a purge. So it wasn’t cheating exactly, but out of necessity. The next area on my list was magazines, and I can tell you that I was dreading this task. We have a magazine problem in my house that several months ago had almost reached crisis status. I have already reorganized our magazines four different times. Yes, that’s right. Four. 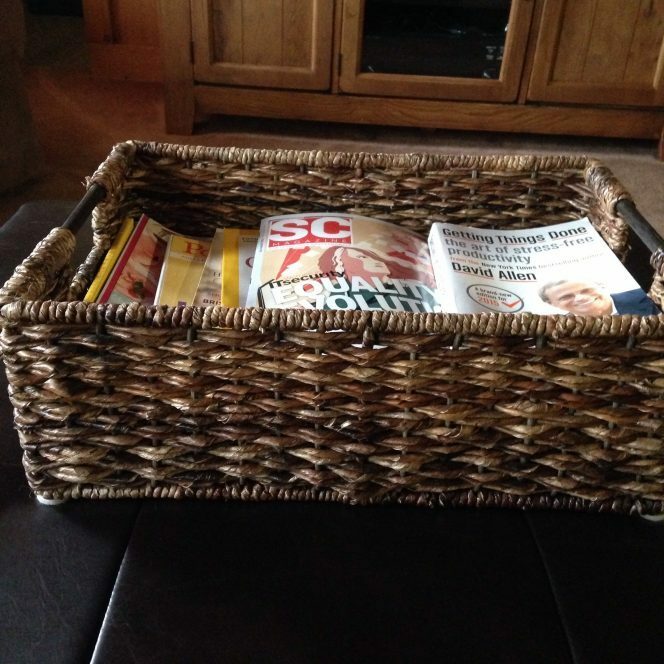 I am in love with this latest solution, which is a large basket that lives on the storage ottoman in front of our couch in our family room. I’m fairly sure I bought it at Target. The idea was that new issues would come into the house and be placed into the basket on the bottom, so that the oldest issues were on top. That way when you wanted to read a magazine, you could just grab one, knowing that if it was on top, it was an older issue that hadn’t been read yet. The problem with this was that I’m not the only one who lives in my house, but I’m the only one who cared enough to carry out this task. The other problem is that we regularly get gift subscriptions to magazines from well-intentioned people, and the amount of magazines coming into the house was getting out of control. Several months ago I did a few things that helped with both of these problems. I announced that the magazines either needed to put at the bottom of the basket, or they needed to stay in the mail basket until I could attend to them. I also contacted the well-intentioned people who have been gifting us magazines and asked them to very kindly stop, please and thank you. While we appreciate their thoughtfulness, this season of our lives is just too busy and we can’t keep up with the reading of the magazines to enjoy their gift. In fact, I have guilt about the amount of unread magazines that reside in my house. The darkest spot in my entire house: you have no idea how hard this photo was to take. Next, I sorted out the magazines that were going to take the longest to read: National Geographic, The New Yorker, and two writing related magazines I get. I moved these to an empty shelf on a bookcase in our family room. I knew if I moved them somewhere out of sight they would never get read. 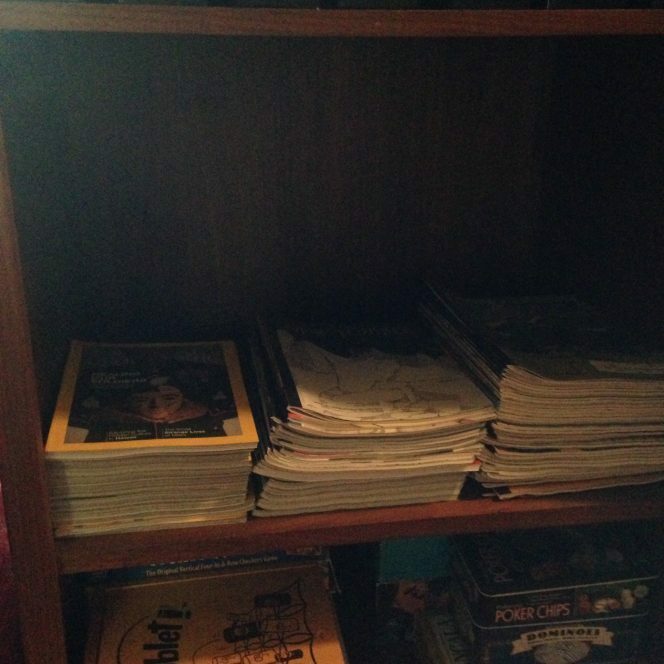 That pile holds all of last year’s worth of National Geographic, and from March of 2015-now of The New Yorker. My husband has read all the National Geographic magazines and I’m the one who wants to read The New Yorker. Some day I hope to write for either of those magazines and I was the one who got the subscriptions last year when I was either feeling ambitious about the amount of free time I thought I was going to have, or I had a momentary lapse of sanity. Today, I took all the magazines out of the basket and sorted them by type. I was pleased to see that some of our subscriptions have expired, and that by reading one here and there when I eat lunch, I have managed to keep our backlog out to only June. That felt like a huge success. There is a book in there because my husband has been reading it in his fringe hours at the start and end of the day and he must have figured that was as good a place to keep it as any. I did not renew our subscription to Yankee magazine, so I need to check with my husband and ask if he’s read those. If so, when I’m finished with them they will get recycled. I also need to find out if he’s read the National Geographic magazines. If so, they are going into the above mentioned stack. When I am finished with all those magazines (it is one of my summer goals), I am going to donate the entire lot of them to a local school. As for the rest, I took several approaches. 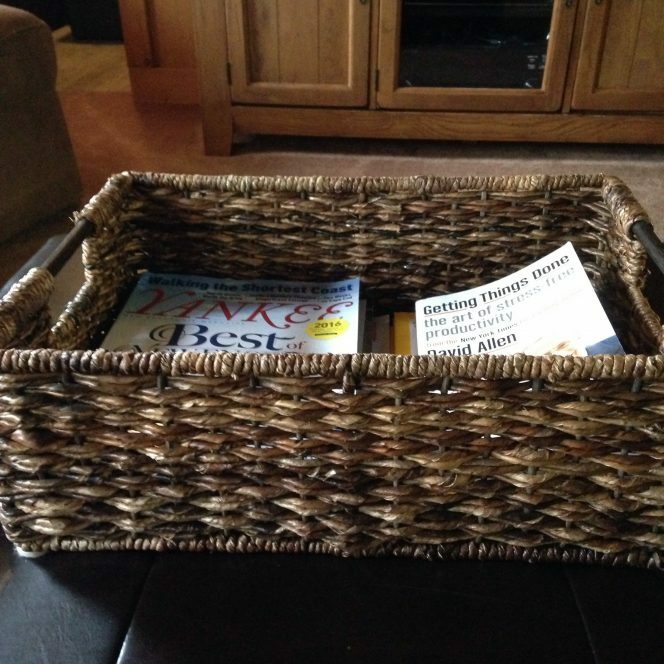 I put the Yankee and National Geographic magazines, along with the the assorted magazines my husband and I both read back into the basket. The Vegetarian Times magazine went into my inbox in our office, as I will be working on menu planning for August during the next few weeks. I sent the Interweave Knits magazines into my creative studio, and put them on the edge of my craft table. They get stored in there when I am finished with them, and I typically read them in there as a self-care break anyhow. My writing magazines were more of a problem. They were originally under this year’s pile of The New Yorker on the shelf in the family room (the middle stack in the photo from above). Except, out of sight equals out of mind here as well, and when I looked at that pile, all I saw was a stack of The New Yorker’s. 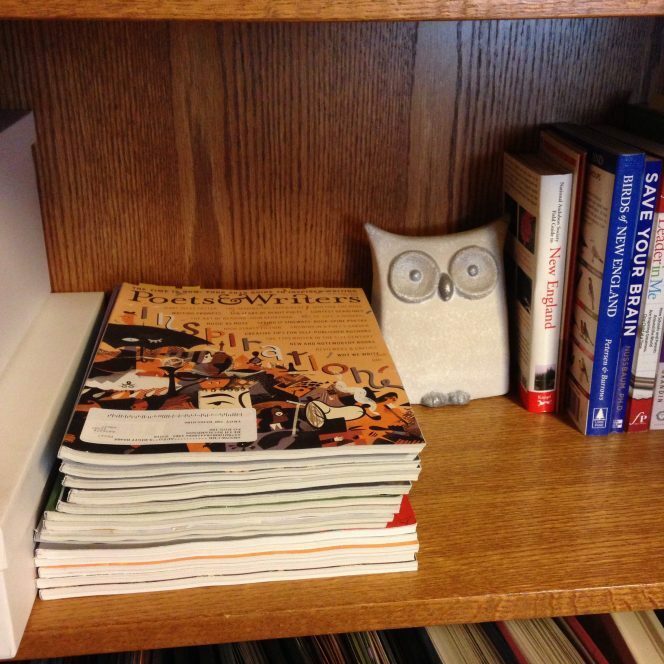 In fact, until I took all those magazines off the shelf, per Marie Kondo’s “make sure you handle every item” instructions, I didn’t even remember they were there. I want to read them, and I feel fairly certain that at least one of the magazines I’m going to be saving for reference reasons. So for now, I have put the entire stack on a shelf in our office. I’m not convinced this is the best place for them, as this entire shelf is half-hidden by the door. However, this is the best place for them at this moment. Beth, I am returning the visit. Magazines…a past nemesis for me. This year, I am subscribed to 3, only 3. I too have a basket on a foot stool! 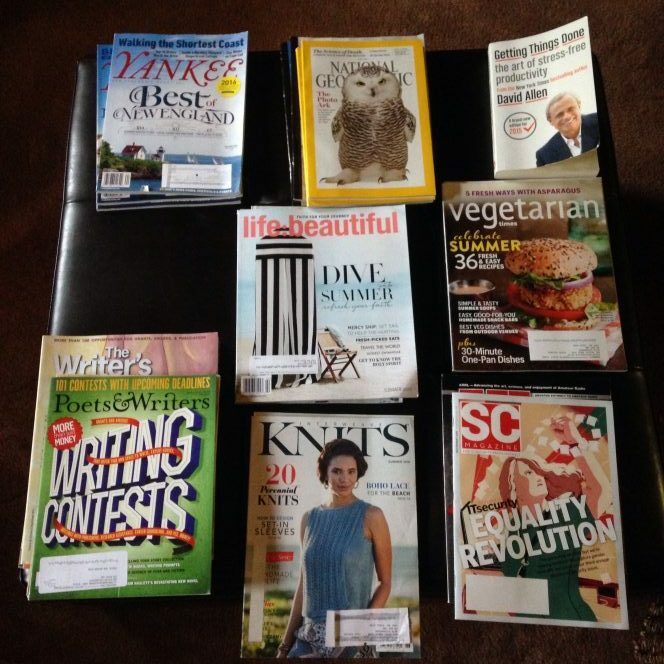 I donate old magazines to the library. I love magazines.